The Mid-Autumn Festival has a tradition of civil disobedience in Chinese history. In defiance of the Central Government’s denial of Hong Kong people’s democratic rights, we pledged an era of peaceful resistance. HONG KONG — For months, democracy advocates in Hong Kong have called for an open election for the city’s leader and for international pressure to be exerted on Beijing to not interfere with Hong Kong’s autonomy. The three organizers of Occupy Central with Love and Peace have recently received the Ice Bucket Challenge requests from some pro-establishment Councillors. We appreciate its achievements of the IBC in raising public awareness on amyotrophic lateral sclerosis (ALS). However, we think that there are many more problems in our society that have not gained the support they deserve. The best way to promote love and peace is to encourage the general public to support organizations that foster public welfare. 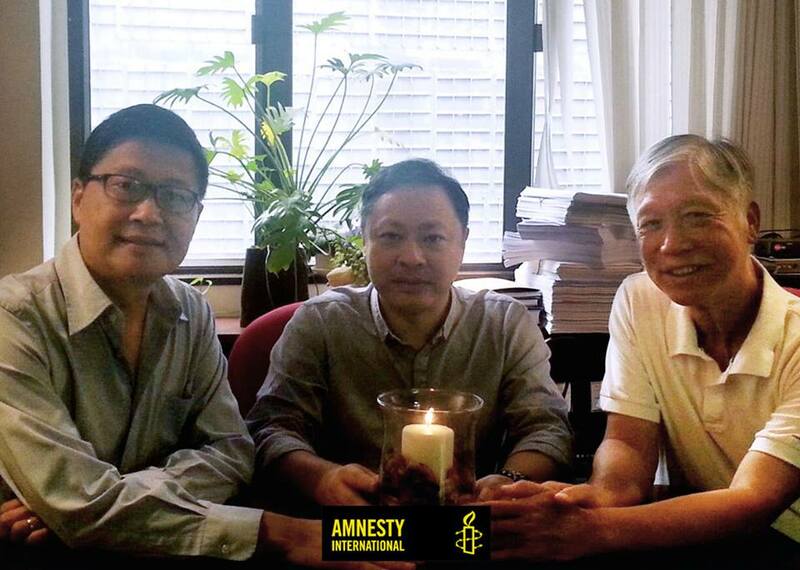 Therefore, we’d like to respond the requests with a donation of HKD 3000 to Amnesty International to support prisoners of conscience and to let the world see that justice can be served. About 600 pan-democrats and activists hiked to The Peak yesterday calling for genuine universal suffrage in the 2017 chief executive election. Among those who showed up at the event organized by Occupy Central were stalwarts Martin Lee Chu-ming, Audrey Eu Yuet-mee, Alan Leong Kah-kit, Gary Fan Kwok-wai, Albert Ho Chun-yan and Emily Lau Wai-hing. The Occupy Central movement will plan “wave after wave of struggle” culminating in its blockade of the city centre if Hongkongers are denied a genuine choice of candidates in 2017. Speaking at a hike for democracy that drew about 300 participants yesterday, Occupy founder Benny Tai Yiu-ting said core groups of the campaign as well as major student activist groups would meet to discuss their strategies next Sunday, immediately after Beijing announces its framework for universal suffrage in Hong Kong. Almost 10 per cent of the 28,000-strong police force gathered yesterday as units from across the city took part in what is understood to have been the second major exercise to prepare for the Occupy Central civil disobedience campaign. In any freedom struggle, much of the struggle is between not only the oppressed and their oppressor but between the oppressed themselves, some of whom side with the oppressor, and within each of the oppressed, who in struggling against their oppressor also struggle against the voices within themselves that tell them to unconditionally obey authority or that there must be something wrong with them if they have such a grievance against ‘the way things are’, or that even if there is something wrong, it is utterly futile to fight it. The fault lines are many. Such is the case in the Hong Kong freedom struggle. This is the result of Hong Kong’s history as a colony and an immigrant society. In the entirety of its modern history, from the start of British colonial rule in 1842 up to today (when Hong Kong finds itself under the new colonial rule of the Chinese Communist Party), Hong Kong has always been a colony and never a democracy. Like the rest of China, it has no democratic tradition. Much of the current freedom struggle involves building the democratic culture Hong Kong has never had from the ground up. Creating culture and changing culture is by no means an overnight process. It takes time. The question is, does Hong Kong have the time it takes?